The Chrome Squad is an elite group of students at Royse City High School that provide tech support and learning opportunities for both students and teachers. In the four years the Chrome Squad has been in operation they have evolved--developing new teams and products to serve not only Royse City ISD, but others districts as well. The Chrome Squad has helped over 50 other districts across the US start student internships, spoken at conferences like TCEA, and have been able to spend time at the Googleplex and Google HQ2 in Austin, Tx. The Chrome Squad is made of twenty-one 10th-12th graders working across 8 teams. 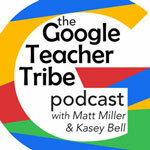 There have been a few changes since the Chrome Squad was last on the Google Teacher Tribe Episode 8. They have started a podcast that focuses on the great things teachers are doing and the ways a teacher can better empower learners with technology. You can find the teaser for the podcast on iTunes (Google Play will be coming soon). The Chrome Squad also adopted a goal setting process used by companies like Google called OKRs, or Objectives-Key Results, as well as Design SPRINTS. This has allowed the Chrome Squad to design and project plan an entire year’s worth of work in a few days during the summer.